Normally, I go around and tell all my friends about hyped games, or games I think that just about anybody would like (if given a chance). Then there are the games that I follow that I don’t really tell anybody about. I don’t think everyone should play them. They probably won’t be 9.0+ games. But who cares? These are games I think look interesting to me, and you may think so too. To kick this off: Dark Sector. Okay, so I cheated on that disc weapon. 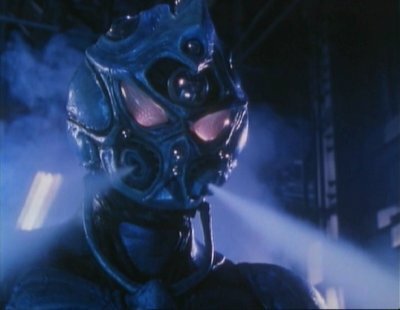 And it is doubtful anyone knows Guyver (either the anime, or the live action american films). I’ve seen large chunks of both. They are both awesome in a very 80’s action kind of way. Think Ninja Turtles movies, but with blades on the elbows. Anyway, the game’s premise is simple. You are infected with a disease that slowly turns you into a monster (that looks badass) and you are armed with a few guns, and this blade that you can throw at enemies to cut them in half. It can target multiple enemies, or be used in melee. You can also imbue it with fire, ice, etc to solve puzzles, or just be extra nice and cauterize the wounds you cause. The history behind it is this was the first next gen game to be shown. It used, and was built for, next gen hardware. Unlike gen 1 xbox 360 titles (that were ports of xbox engines), this game was built from the ground up. However, it also looked like Splinter Cell in space. Obviously, they ditched that at this point, so you have to hope the team knows what they are doing. Recreating a game from scratch, and initial negative press have me apprehensive. But, they seem to focus on being a cool, powerful character and boss fights. If they pull that off, then it sounds like my kind of game. After all, the Predator Disc was fairly underpowered (took too much ammo) in the AvP games. If they just make that thing fun and easy to use, that alone is worth the price of admission. One thing that comes to mind is a little 1983 fantasy film by the name of Krull. hah. it’s even called a Glaive in that movie, too. the MP sounds interesting, but I’m afraid that it’s going to turn out to feel forced like the Darkness’. I remember reading about this game a while back and getting really excited about the disc and some of the cool things you can do with it. My favorite was limb removal. ← Who crunches numbers better? PC, Mac, PS3?